Bonchon Korean-style fried chicken is an international brand that is currently exploding. 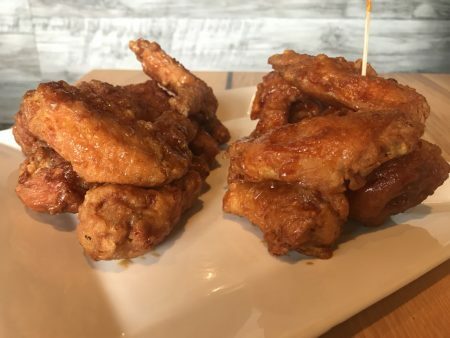 First started in Busan, South Korea, Bonchon has been a hit from the Phillipines to Grand Rapids, Michigan with 88 locations in 19 states in the U.S. and 193 locations internationally. Bonchon just came to Jax in the St. John’s Town Center. Bonchon has a sleek, hip feel to it when you walk in. The menu is beautiful with full page photos with menu items detailed in overlayed boxes on each page. 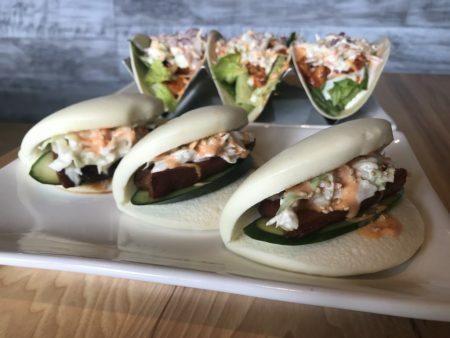 It is divided into six sections: fried chicken, traditional Korean dishes, Asian fusion, buns/wraps/tacos, salads, and sides/add ons. There is a little bit of something for everyone at Bonchon. On our trip to Bonchon we really did try a little bit of everything. We had both the soy garlic fried chicken and the spicy fried chicken in wings and drums. This fried chicken is absolutely perfectly crispy, the kind of crispy fried chicken dreams are made of. Both flavors conveyed nicely, and we didn’t find the spicy chicken too spicy for our modest palates, although that trick is to not let it touch your lips and it won’t light you up. The fried chicken comes with your choice of pickled radish or cole slaw. The pickled radish is recommended for helping to clear the palate and to help cool you down if your mouth gets a little too fiery. The thing we noticed about the fried chicken and coleslaw is that both were southern style adjacent. If no one told you the chicken and slaw were Korean, you would just think the chicken was extra crispy with fun flavors and the slaw was not quite as sweet as is typical. They were both quite similar to familiar southern style dishes, but the experience was slightly different than southern. Fried chicken may not be a long held traditional Korean dish, but it is and has been for some time wildly popular in Korean cuisine. Fried chicken at Bonchon takes up to 30 minutes to cook. Bonchon does not serve their sauces on the side because they want all their guests to have the Bonchon experience and sauces on the side would alter that. The Salmon Avocado Ball was a super fun dish perfect for sharing, if you’re that generous. It had fantastic visual appeal and delicious flavor. 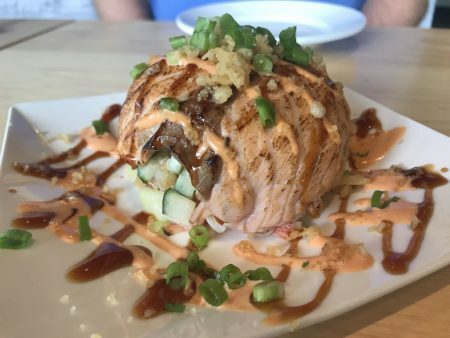 Avocado, imitation crab meat, and cucumber wrapped in salmon, the only spicy thing about this dish was the spicy mayo. Next up was the Tteokbokki, a traditional Korean dish of rice cakes and fish cakes in Bonchon hot sauce with mozzarella cheese. 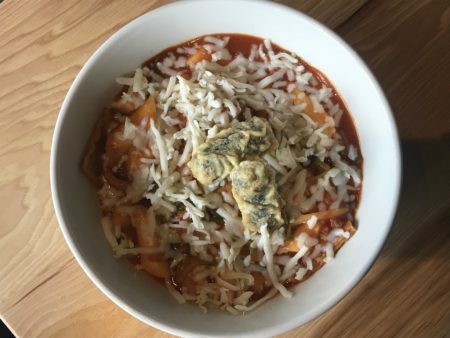 This dish is definitely for the spicy food lovers. It was spicier than the fried chicken and we could only handle a few bites, though the textures and flavors were dynamite. Last were the Korean Tacos and Pork Buns. 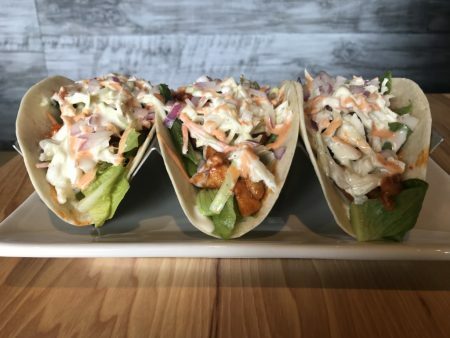 The Korean Tacos come with either spicy fried chicken or marinated ribeye, slaw, ranch, spicy mayo, and red onions. They definitely had a kick, but were stuffed full of goodness. The tacos come with three per order and are generous in size. 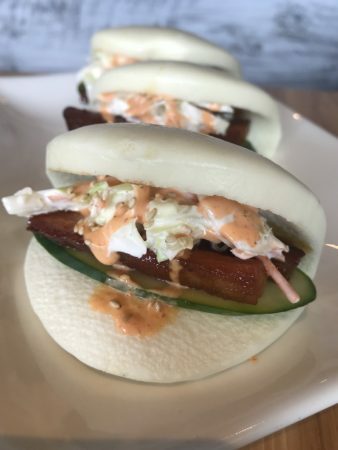 The Pork Buns are squishy soft bao buns stuffed with pork belly, soy garlic sauce, cucumber, slaw, spicy mayo, and katsu sauce. These were especially yummy and less spicy than the tacos. Overall we were impressed with Bonchon. The space is cool, the service is excellent, the prices are reasonable, and the food is delish. With football season upon us and the flavors of that chicken dancing in our heads we asked about to go orders. For now Bonchon is not taking any to go orders, as they want to make sure all of their guests dining in get the best experience possible. Welcome to Jax, Bonchon! We’re glad you’re here! Tagged Alcohol Serving, asian, Casual, Dinner, Fried Chicken, International, Korean, lunch, new restaurant, Serves Alcohol, Southern/Soul, trendy. Bookmark the permalink.